San Diego County Crime Stoppers Wednesday offered a $1,000 reward to anyone who can help locate the arsonist who set a hot dog cart on fire near the main entrance to Horton Plaza late last month. The Brooklyn Dogs hot dog cart was parked near the main staircase to Horton Plaza when someone lit its canvas cover on fire about 5:45 a.m. on Sept. 24. The flames extended to the cart and caused an estimated $8,000 in damages, according to Crime Stoppers. 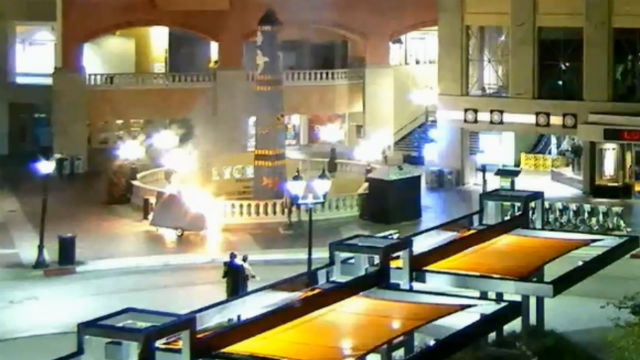 San Diego Metro Arson Strike Team investigators said they have no information on the suspect, except that a person was seen running from the area at Broadway Circle, adjacent to Horton Plaza, when the fire occurred. Anyone with information about this case is urged to contact the arson team at (619) 236-6815 or the anonymous tip line at (888) 580-8477.